KAMPALA– It looked Christmas and felt like Christmas. As Uganda goes into Christmas, those who grew up in the 1970s, 1980s and 1990s recall Christmas as a time for serious merrymaking and joy. From cards sent to decorated city streets and houses, it was a time to drop everything else and have fun. A number of businesses closed for days and newspapers carried the President’s goodwill messages on page one. How times have changed! Those who have watched the transformation, and with help from the archives, PMl Daily shows you how Ugandans celebrated the birth of Christ over the years. Perhaps due to Uganda’s young economy in the 1970ss and 1980s, most people, including grown-ups, waited until Christmas to go on a shopping spree for new clothes. This was also the only time some could afford “special diets” like rice, Chicken, Chapati and Beef. 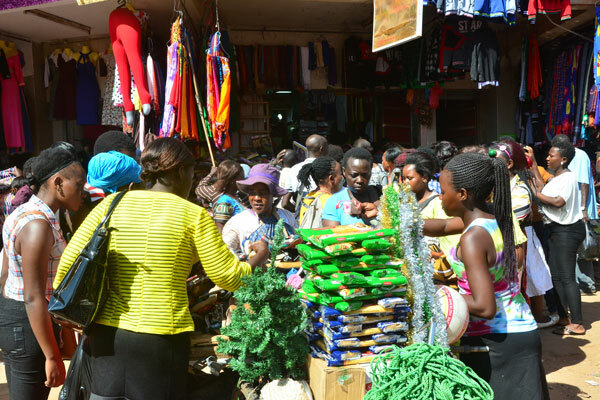 “We could not afford to eat those expensive meals on a regular basis,” says Mr Ezekiel Masaba, also a local trader dealing in Matooke at Nakawa market. The craze to travel upcountry and to celebrate the birth of Christ with relatives was also quite strong between the 1970s and 1980s. There was also some reverse migration for a smaller number of people from rural Uganda to celebrate Christmas with relatives and friends in urban areas. Travelling to towns, especially for the first time, was an honour. Because when we go back to the villages after Christmas, we became kings and we would gather village folks to tell them how vehicles, trees and houses were moving and how God has actually built high houses in the town plus how we ate rice and chicken. Martin Nangoli, now a pastor at Wake up ministries explains how one village boy came back from Kampala and told them how Coke Cola in Kampala was sweeter than that sold iin the villages. And just like some people from major cities and towns are doing today, back in the day, many travelled to and from their rural areas with food and chicken. And on the return journey, they went back with rice, new clothes, bread and some money to spend in the villages. While some things have remained unchanged, many others are totally different. Just like on Christmas day millions of litres of alcohol will be drowned and thousands of chickens, goats and cows slaughtered as Ugandans break the banks for the celebrations. In years gone by, people got stranded on the roads due to exorbitant fares and lack of enough public service vehicles. Reports of road accidents during the festive season were also as common as they are today. In urban centres, people would carry equally huge bags full of cooking items and clothes as gifts for their friends. Today, this is no more as shopping vouchers are the in-thing. “Globally, this (voucher) is already a major gift item as it provides the receiver with the gift of choice,” says Ms Sarah Namubiru a worker at one of the biggest companies in Kampala. Ms Stephen Wobusani of the ministry of trade and industry says the culture of gifting in Uganda has changed significantly over the past few years. Mr Wabusani says in the past, buying a youngster a bottle of soda in the village trading centre and giving them Sh5 pocket money or some sweets was enough on top of a good meal and new clothes. But today, some expect gifts worth thousands of shillings for Christmas. “Today, children have access to clothes at any time of the year and their exposure to brands, movies, television shows and even the Internet is growing all the time,” says Mr Wabusani. Today, many Ugandans have started crafting creative messages to be sent via social media sites or SMS, this means that the cards we used to send via post office have stopped. The trendy communication tools available on smartphones such as WhatsApp, Facebook, Instagram, Viber and Blackberry Messenger, which are virtually free and popular among the youth, have also come into play. Things were different, though, back in the day people only sent messages through Post office. But today, Post office is a shadow of its former self and with the lowering number of customers sending letters, Christmas mails at the Post Office, post office bosses are worried that the service might completely disappear if they don’t adapt to the times. Messages today other than text messages — some widely circulated — many people now simply send e-cards. UCC head of public relations Ms Pamela Ankunda says the simplicity of sending such electronic messages to multiple recipients diminishes the special feeling attached to cards. “It encourages laziness on the part of senders as they do not have to go out of their way to search for a special card for loved ones. The ‘new culture’ of the e-card also suppresses creativity,” says Ms Ankunda. Although villages and urban centres used to be flooded with commercial photographers, these days they have a dry Christmas due to the changing technology as people now take “Selfies”. Today, there is a sharp increase in the sale of smartphones with high-resolution cameras — which seem to be replacing digital cameras — this means that trips to the photo studios are also getting lower and lower. In the past, people dressed as Father Christmas would also present gifts to children in major urban centres, but the practice has died down, perhaps due to harsh economic times. Today, rather than dropping down the fabled chimney at night to leave gifts, Father Christmas is likely to be spotted ringing a bell outside a fast food joint or an “exhibition” store to entice customers. Despite the many changes, one thing remains firm in Uganda: the Christmas cheer continues!